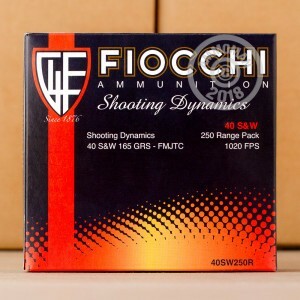 This 250 round box of .40 S&W ammunition from Fiocchi will serve you well at the range. These rounds fire a light 165 grain bullet at a relatively high muzzle velocity of 1,020 feet per second (and produce recoil to match). This results in external ballistics similar to those of many popular self-defense loads, which use lighter projectiles to produce more reliable expansion. A great practice load for the Smith & Wesson M&P, Springfield XD, and Glock 23/22. 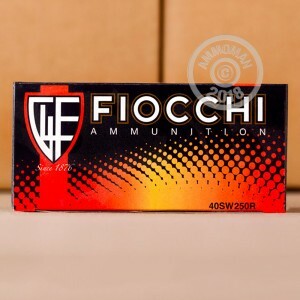 Fiocchi ammunition is loaded in Ozark, Missouri and Lecco, Italy and has a strong reputation for delivering reliable, cost-effective ammunition. Their ammo uses non-corrosive Boxer primers and brass cases. 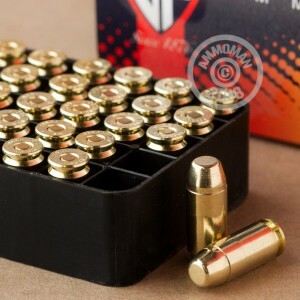 Enjoy free shipping on all orders over $99 from AmmoMan.com--this includes most 250, 500, and 1,000 round cases!